The scene: The bedroom of Theodore "Beaver" Cleaver and his older brother Wally, located in the middle-class community of Mayfield. Beaver is sitting on his bed holding three paperback books. Wally is doing what he always does: standing in front of the mirror brushing his hair. Beaver: Can I ask ya a question? Wally: Okay, but ya better make it snappy. I have a date with Mary Ellen Rogers. Beaver: I was picking up old newspapers and magazines for the Cub Scout paper drive and I found these books about us, and they was written by Beverly Cleary. Wally: Oh yeah, I remember those. 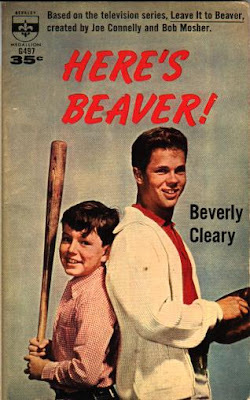 LEAVE IT TO BEAVER was published in 1960, HERE'S BEAVER was published in 1961 and BEAVER AND WALLY came out later that same year. That one's my favorite. Beaver: Probably 'cause it's got your name in the title, ha-ha. Wally: Ha-ha, you're probably right, Beav. Beaver: Wally, can you 'splain sumpthing about these books? Wally: Okay, but you gotta hurry up, because Eddie Haskell is coming over to pick me up any second. Beaver: I thought you was going on a date with Mary Ellen Rogers, not Eddie Haskell. Wally: You goof! It's a double-date and we're taking Eddie's car. Beaver: Oh. 'Bout these books: you mean they was only published as paperbacks and didn't come out in hardcover at all? Wally: Yep. Paperbacks only. Thirty-five cents a piece. Beaver: Gee, that's kind of crummy. Especially since they was written by Beverly Cleary and she won the Blueberry Award. 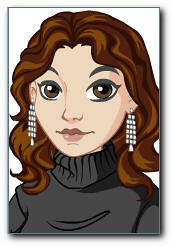 Beaver: She created all those famous book-kids like Henry Huggins and 'mona Quimby. What was she writin' about US for? Beaver: What did you just mumble? Wally: "Published by Twayne in 1991." Are you gonna let me finish or not, Beav? Wally: That book said, "These books...have little of Cleary in them: they lack her air of easy confidence, and she seems uncomfortable with Beaver's 'gee-whiz' style of thinking and speaking that is so different from her own Henry Huggins. In novels that are almost collections of short stories, television episodes are expanded or altered or combined to emphasize family and growing up." Beaver: You mean she wrote our TV scripts too? Wally: Naw, she just took the TV stories and mixed 'em up and added a hunka this and a messa that and made books outta them. Beaver: Do I really have a gee-whiz style of speakin'? Beaver: I never knew that. Gee whiz! Wally: Well, I gotta go. I just heard Eddie Haskell drive up. Beaver: It doesn't seem quite right. Everybody knows the books Beverly Cleary wrote about Henry and Beezus and 'mona, but nobody knows that she wrote about us. It's like we're the bad stepkids or sumpthing. Eddie Haskell (entering the bedroom): Oh, so your parents finally told you that you were adopted, huh, Beav? Wally: Aw, leave the kid alone, Eddie. 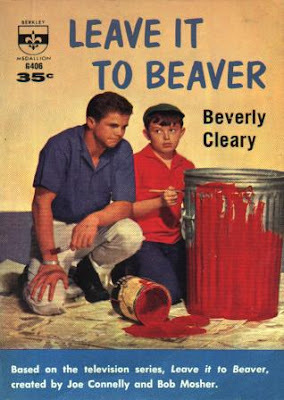 The Beaver's just upset because he found out Beverly Cleary wrote three cheap paperback books about us that nobody really knows about. He wants to know why she wrote them. Eddie: Why don't you ask the Bev? Eddie: No, the Bev. The Bevster. Your wicked stepmother. The dame that wrote the books. I bet she's listed in the phone book. (Picks up phone book which just happens to be laying -- way too conveniently -- on the bureau and copies down a number, then sits down at Wally's desk and dials the phone.) Hello, young lady, I'm trying to get in touch with Mrs. Beverly Cleary. Oh, you ARE Mrs. Cleary? I thought it was your daughter, because you sounded so youthful! Well, ma'am, I have a friend here, young Theodore Cleaver, who is a fan of your wonderful, thoughtful, humorous, illuminating, and always well-written bo-- (Pause.) Stick a sock in WHAT? Is that any way to talk to a fan, Mrs. Cleary? I'm merely trying to help the little lad understand why, after writing so many of your own books, you ended up writing three paperback TV tie-ins about this little goofball...I mean, this fine young man. Uh-huh, uh-huh, I see. Well, thank you, Mrs. Cleary. I hope you and your family have a most pleasant eveni-- (Pause.) I think we got cut off. Beaver: What'd she say, Eddie? What'd she say? Eddie: She said she wrote the books 'cause she liked the TV show and thought she could use a little extra money. And she wants to know what you're complaining about since you're still earning residuals off your TV show, but she hasn't made a dime from those paperbacks since JFK was in office. Now scram, kid, me and Wally have two chicks waiting and we don't want to disappoint them. Beaver: What am I 'sposed to do here by myself? Wally: Read a book or something. Beaver: Hey, another book about me! And this one's in a hardcover too! Funny and fascinating! Thanks for sharing this. Excellent! Wally and the Beav sounded exactly like Wally and the Beav. And what a funny bit of trivia to know. Thank you. I had NO idea! But now that I think about it, Beverly Cleary doesn't come up a lot in contemporary discussions of children's literature, even those that are focused on scholarship and literary history. I wonder why that is. Did I just miss the moment? Is it a bit too early for the scholars and a little late for Cleary to be news? Not too long ago I read Cleary's early teen novels (Fifteen and The Luckiest Girl) with glee, and now she's looking even more like a figure whose longevity and diversity illuminates a whole lot of corners of children's lit. Classic stuff! I'm always on the hunt for great children's books and have recently discovered Bayard and their series of StoryBoxBooks, AdventureBoxBooks and DiscoveryBoxBooks (which has a special focus on teeth!) They have work by acclaimed children's books illustrator Helen Oxenbury appearing in the Storybox series for September. In addition to this, they also have some great activities for rainy days: http://www.storyboxbooks.com/potatoprinting.php, http://www.adventureboxbooks.com/macaroni-picture-frames.php, http://www.discoveryboxbooks.com/skittles.php Enjoy! Haha, wonderful post! I used to have one of these but never wrote it. It looked like a "I need some quick money" type of book to me too. I happen to know Beverly, and know that she wrote these books when she was in the beginning stages of her career. And yes, according to her, in those days, the extra money helped. (Thank you, Beav.) For anyone fortunate enough to own a copy of one of these titles, the extra money for selling it would certainly amount to more than old fashioned "pin money." Wow, this was REALLY well done. And we all learned an important lesson.